Sammy Ikua Gachagua had lost his father to illness, his mother to abandonment, and his home to poverty. By age ten, he was living in a shack with seven other children and very little food. He entered an orphanage seeing it as a miracle with three meals a day, a bed to sleep in, and clothes on his back. When Claire Diaz-Ortiz arrived in Kenya at the end of an around-the-world journey, she decided to stay the night, climb Mt. Kenya, then head back home. She entered an orphanage seeing it as little more than a free place to spend the night before her mountain trek. 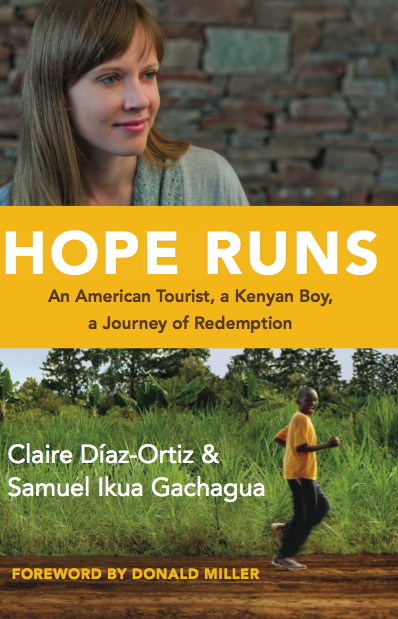 Hope Runs is the emotional story of an American tourist, a Kenyan orphan, and the day that would change the course of both of their lives forever. It's about what it means to live in the now when the world is falling down around you. It's about what it means to hope for the things you cannot see. Most of all, it's about how God can change your life in the blink of an eye. When I first decided to review this book, I wasn't quite sure what I was getting myself into. I was ready for an emotional read and I found one. What I wasn't ready for was how this book pulled me in and kept me reading. The diary format makes it easy to find places to put the book down, but I had a hard time doing so. This one is going on my shelf and I suspect it won't be too long before I'm pulling it down again to read.